Al SharptonSen. Rand Paul and Rev. Al Sharpton meeting in Washington. 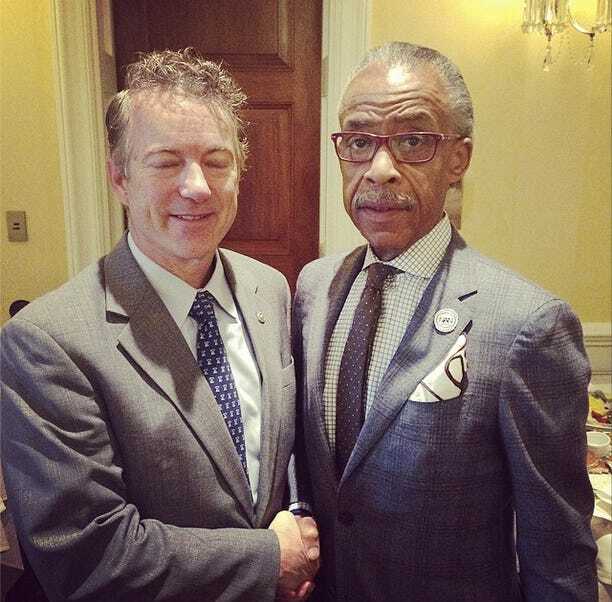 Sen. Rand Paul (R-Kentucky), who is likely running for president in 2016, had a meeting with the Rev. Al Sharpton in Washington, D.C. Thursday morning. Both men characterised the conversation as an attempt to foster dialoque across party lines. “It was a very candid and courteous conversation. We pledged to continue to have such conversations where conservatives and progressives can have dialogue and break the log jam in American discussion,” Sharpton said in a statement. According to Sharpton, the pair discussed Paul’s “position on dealing with some criminal justice issues that I am concerned about.” This included “mandatory sentencing” for drug-related charges and legislation Paul and Sen. Cory Booker (D-New Jersey) have proposed to limit punishments for non-violent drug offenders. In addition to “criminal justice reform,” May also noted the two talked about Paul’s support for the “demilitarization of police.” She said they also discussed Paul’s recent trip to Ferguson, Missouri where protests this summer over the death of an unarmed African-American teenage who was shot by a police officer were met with a violent crackdown by local law enforcement. Sharpton noted the two did not see eye-to-eye on everything. Specifically, he said they disagreed over President Barack Obama’s plan to issue an executive order to shield some undocumented immigrants from deportation. Sharpton supports Obama taking executive action while Paul does not. Paul has made reaching out to African-American voters a priority as he considers a potential presidential bid. A recent poll found New Yorkers consider Sharpton the city’s most important black leader, above even Obama.